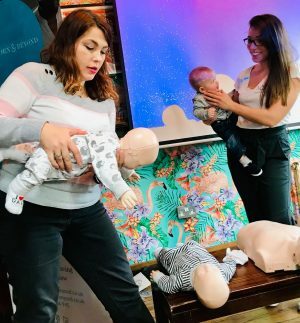 I can’t stress enough how important baby first aid is. I remember when Yianni and I first brought Theon home. We leapt through the front door with our new bubba, running completely on euphoria. Then as all our guests finally left, the realisation kicked in. Us and us alone were entirely responsible for keeping this tot alive and well! We spent much of his first months practically camped outside of the local A&E ‘just incase’. Fearing every twitch and cough! We just weren’t prepared enough. With Penelope it was completely different we were calm, relaxed, experienced parents. And yet that didn’t stop us waking up one morning to a very limp, pale baby; burning with fever. It was viral meningitis. While we called 999 her eyes rolled several times as her lips turned blue. It was without a doubt the most terrifying time of my life. Founded in 2016 by Dr Camilla Eiffe and Nurse Leila Saadi. Two health care professionals who became good friends and shared the same vision. Together they’ve created a service for parents, care givers and health care professionals. Striving to empower others with the knowledge and skills needed to manage a sick child. 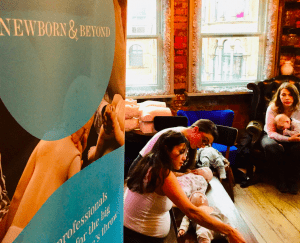 We teamed up with Newborn & Beyond to offer some *free, bespoke, first aid training to a selection of our followers. As part of our dont #keepmum campaign. A platforms in which to assist and give a voice to new parents. 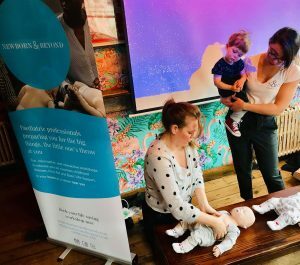 It was Paediatric A&E Nurse and Newborn & Beyond co-founder Leila that led our session. The Life Support workshop that we had was aimed at empowering each of our parents with the skills to administer basic first aid and maintain life while emergency services are on route. The greatest part for me was how open and understanding Leila was to the needs of each parent. From allowing ‘babes in arms’ to attend to focussing on key areas of concern out lined in our pre-class coffee and chat. Yianni and I are both adult first aiders who regularly attend refresher courses. However, both of us agreed that doing a toddler and baby specific class was not only good for upping our skill set, but immensely reassuring as parents. Anyone who cares for child(ren) in any capacity knows just how vital learning such key elements are. *This session was kindly gifted to us by Newborn & Beyond to help raise awareness. However all opinions within this article are our own. This is an absolutely brilliant post!! Definitely something that should be shared more – such an important topic. Yes, we were so lucky to be offered such a fantastic opportunity! It’s such an important topic, I’m glad you’ve shared and you had the chance to learn about it. What a great opportunity! It really was, I’d definitely recommend it to other parents or those working with children and/or babies. Such an important skill to learn and piece of mind is priceless!